The Cave sits beneath the Omni Mount Washington Resort. Despite its name, you don't have to be an expert spelunker to grab a drink at The Cave. However, back in the day, your best poker face would have worked to your advantage. 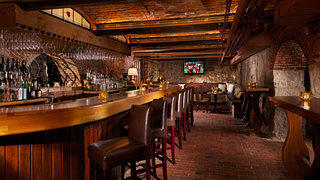 The Cave, which opened in 1902 as a bar at the Omni Mount Washington Resort in New Hampshire, would have been considered a regular old bar were it not for Prohibition. 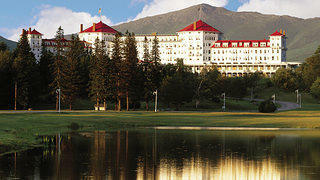 In the 1920s, a guest staying at the hotel in Bretton Woods may have casually mentioned to a friend that they were going to play a game of squash. Then, they would make their way through a narrow sloping entrance way surrounded by rough cut granite on all sides to The Cave. There was indeed a squash court (today it is the dance floor). Patrons would sit or stand around the court with teacups in hand, presumably filled with tea. Or at least that’s what the police would think if they chose to raid The Cave, which was situated on a prime bootlegging route near the Canadian border. Craig Clemmer, director of marketing at the hotel, says that the bar wasn't raided often, but guests could never be too careful. Today, you can take a peek at a brick wall tucked away in a stone grotto underneath the front driveway. One of the bricks could be easily removed to give a person a clear view of the road below. If they spotted the cops, everyone could quickly hide away their liquor in the grotto, grab their teacups and a squash racket, and give the nonchalant appearance of gathering for a game. Today, guests don't need to come up with an excuse to make their way down to the bar around 9 o'clock each night. It's not the only bar at the resort, but it is certainly the most infamous. 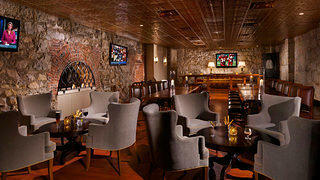 In addition to enjoying a drink while watching a game on a big screen, The Cave also hosts jazz weekends and Prohibition-era cocktail receptions. While patrons don't need to hide their liquor behind tea cups, the dark hardwood and granite walls create an atmosphere at The Cave today that is cozy and neat, just like it would have been 90 years ago. You’re Having: The Prohibition punch, a rum-based punch served in a tea cup, or a Manhattan, made with Mount Washington Woodford Reserve Kentucky bourbon. Best Yelp Review: "Great little bar hidden in the basement of the very luxurious hotel. Get there at sharp for a guaranteed seat at the bar, for it can get very busy. Eric took great care of us and offered an exceptional Omni woodford reserve bourbon. A must try!" -Donald O.